LOOK! Our Showrooms you can WALK through RIGHT NOW on your computer! A 360-degree walking and moving TOUR of our showrooms through Google Maps! It’s actually quite A-MAZE-ING! Check out our ONLINE STORE is where you can BUY our TNT Amusements t-shirts in three colors, DVD’s, Frank’s BATTERY BOARDS, and Frank’s TOMMY BLINDERS Board! to send pictures or attachments, or general questions! Our goal is to bring real Arcade Games and Pinball Machines right into the comfort of your home, whether you live near us in Bucks County, PA, across the United States in California, or Worldwide – France, Australia, and beyond! Arcade Games in your Home! 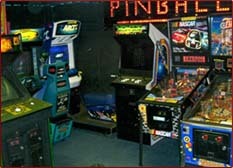 For 36 years, we have provided people in Philadelphia, Bucks County, Delaware County, Chester County, Montgomery County, Lancaster County, and now all around the country and the world with our extensive line of full size Arcade Video Games, Pinball Machines, Shuffle Bowling Alleys, SkeeBall Machines, CD & 45rpm Jukeboxes, including IN HOME SERVICE (in a 100 mile radius)! We have many customers in North, South and Central New Jersey, all of Delaware, parts of Maryland and New York who take an easy drive to our showrooms to select their gameroom treasures. Our own truck and men are able to deliver, set up and provide future service without the worry of subcontractors or substandard service men in a 100 mile radius. Our non-local sales continue to grow, with the ability to deliver our games throughout the USA and the World – and provide technical support over the phone and Internet. Our legendary FIVE-YEAR service plan is included with every single machine we sell (giving you a lower cost board repair and low cost labor if you are in our service area)! 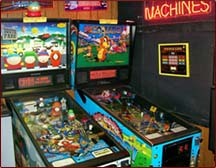 Largest Selection of different Arcade Games in stock! We maintain a showroom with over 100 working & playable machines in a 3000 square foot area. Plus, our Inventory CONSTANTLY changes as machines sell and are replaced by others. We have a separate 5000 square foot warehouse double stacked with various DIFFERENT games in stock and have sold more than 27,500 machines into the home market to over 13,000 different customers in the last 70 years – more than ANY OTHER DEALERS in the Country! You can book any day, 7 days a week – call (215-953-1188 ext. 0) for available times or simply look at our PRIVATE PARTY page! We are NEVER open for “Open Play” as we are NOT an arcade! So, your party remains private! Book us for TWO or more hours for groups up to 50 people, any day of the week. We can also book a LAST MINUTE, small group party if we have openings at a special discount rate! PICK UP your games YOURSELF & then ENJOY these Local & HISTORICAL and FUN Places. Many of our customers order a machine and then pack up the family and drive to our Showrooms in Historic Bucks County. After stopping at TNT, they spend the weekend, etc, exploring TONS of fun and Historic landmarks all around us! Philadelphia is just 35 minutes away, with Independence Hall, Betsy Ross House, The Franklin Institute, etc etc etc. Then, We are 20 minutes from Washington Crossing with a brand new walk around museum. How about Peddlers Village and New Hope…all under a half hour drive! The now famous Mercer Mansion–Font Hill Castle and Mercer Museum also under 30 minutes! And under two hours is Amish Country in Lancaster PA. 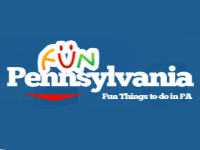 Historic Knoebels Amusement Park, Sesame Place, and Great Adventure too! EXPLORE all the WONDERS of Pennsylvania BELOW!! Please email us at tntquality@aol.com and we will get back to you within the next business day! You can ALWAYS call us (215-953-1188) 24 hours a day – our automation has TONS of additional information! To receive more information on your gaming systems, party rentals, bar, restaurant & arcade rentals, or to schedule a tour, please fill in your information below and someone will be in touch with you shortly!